14 Choreographed Exercises for Body & Soul. All Levels. All Regions DVD. 70 minutes. 14 exercises. Earn up to 32 FJ Rewards. This video was made for mature and older adults who are not physically active but would like to look and feel better without having to take a public class. Now, in the privacy of your own home, you can perform fourteen slow and simple stretches to quietly beautiful music that will relax tense muscles, increase joint mobility and flexibility, and calm the mind. The video has four different ten-minute sections: two are done standing, one seated on a chair, and one sitting and lying on the floor. The exercises are especially advantageous in that there is negligible physical impact. Quietly and methodically, Finis and a demonstrator show you how to perform simple dance-based movements that will rejuvenate your body and soul. All the exercises are listed on the back cover of the DVD image above. Finis Jhung is a master at explaining the art of movement, and the stretches in this DVD are divine. If you are looking to develop your ballet technique, this video is a must. I love this DVD especially when I miss my classes. Finis is so clear with his instructions. You learn so much and you can see the difference in your performance. It is a great resource for dancers. “Five Stars [out of five]. I would give this DVD a hundred stars if I could! “This DVD truly belongs in every home. I own other stretch DVDs but this is my ‘desert island’ DVD that I take with me when I travel and that I turn to for unfailing relief of physical aches and pains and mental stress. 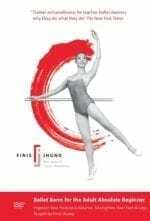 Finis Jhung is acknowledged as an unsurpassed ballet expert, teacher and coach; and one of the many wonderful things about this program is that he, who works with some of the finest dancers of our times, shows such understanding of the challenges faced by those of us who are less physically gifted. This program is very gentle and entirely safe yet it provides a superb, thorough stretch regimen for the entire body. I have done it on my own and also along with my mother (in her eighties) and due to Mr. Jhung’s careful, patient, detailed instruction, both of us were able to ‘customize’ the stretches to the level appropriate for our abilities. The exquisite demonstration by Melissa Elstein provides beautiful inspiration as well as an example of flawless form for those who are following, and the lovely, sensitively nuanced music adds both to the aesthetic experience and gently guides one into following the right rhythm and pace. “The Ten-Minute Stretch Break DVD is taught by Finis Jhung, a nationally respected Master Ballet Instructor in New York City. It includes 14 well-choreographed exercises accompanied by beautiful music. Remarkably, the DVD does not presuppose any knowledge of ballet or being a ballet dancer. The techniques utilized are well within the ability of the average user or even children to improve fitness.